It’s no secret that Snapchat’s core audience is teens and millennials. In other words, people from the older generation. This means that as a brand with a target audience of teens, you have an exceptional chance to reach, impact, and convert your audience that is spending time on Snapchat. But before you start using Snapchat for marketing and to reach your audience, you need to know if it can generate any results, right? Therefore, I’ve compiled a list of Snapchat statistics which are interesting to know about. It contains statistics on everything from demographics to usage, to what it can do for your brand. Snapchat has over 166 million average daily users. No, Snapchat isn’t as large as the biggest social networks in the industry like Instagram or Facebook, however, it still boasts more than 166 million daily which is quite a large number. As a brand looking to target your audience, it won’t matter if the platform has 266 or 500 million daily users. You still won’t reach them all. Snapchat has over 300 million active users. 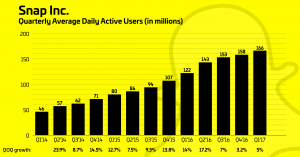 Snapchat’s active users are almost double its daily active user count. While people are comparing Instagram to Snapchat and how Snapchat is falling behind, there is no denying that Snapchat still has a huge audience that brands can benefit from if used correctly. Over 400 million snaps are sent every day. Every day, people are is sending millions and millions of Snaps. By making snapping a part of your marketing and customer service, you can come closer to your audience and build stronger bonds with them. What’s more, understanding what it is your audience is sending and chatting about will allow you to get to know them better. With Snapchat’s current audience base, it reaches 41% of 18-34-year-olds in the US every day. 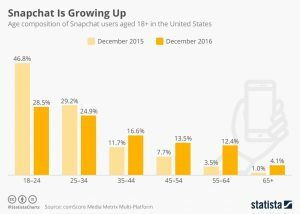 If your target audience consists of people within this age group, Snapchat is an excellent way to reach them and engage with them. There are no other social media platforms that allow you to reach such a specified group of people as Snapchat. 71 % of Snapchat users are under 35 years old. It’s no secret that Snapchat is mainly a social platform for the younger generations. However, this does not mean that people that people who are older aren’t to be found there. In fact, this means that around 29% of Snapchat users are over 35 years old. While the platform is first and foremost for younger people. you might still be able to find lots of people that fall into your targeting. 77 % of US college students use Snapchat daily. If you’re going to impact people and convert them into customers, you need to do it over and over again. For that, Snapchat is perfect, because the majority of their users log in several times every day – allowing you to reach them. Of Snapchat users, 54% of them log in at least once per day. Around 60% of Snap Ads are watched with the sound turned on. If you’re going to create a Snapchat ad, you might want to consider including sound. This will allow the viewers to activate multiple senses. Snapchat is the most used social media platform by people aged under 24. As mentioned earlier, Snapchat is the ultimate social platform to use as a brand if you are trying to target people who are from the younger generation. It is the most used social platform by people under the age of 24 so chances are, you’ll be able to find the people you are targeting. The average user on Snapchat and under 25 visits the platform over 20 times per day. They might visit the platform over 20 times a day, but that doesn’t mean they want to interact with your brand when they do. To captivate your audience’s attention and to make them care about your brand, you need to share content that they actually care about. The average Snapchat user spends 25-30 minutes every day on the platform. Brands are spending more and more money on Snapchat ads, and if your audience is within the millennial age group, you should, too! Snapchat offers you a completely new way to reach your audience that allows intimacy in the conversation. A sponsored lens in the US can cost between $450,000 and $750,000 per day. 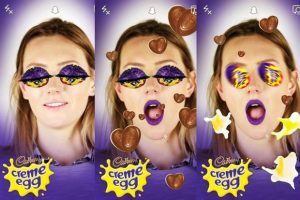 Snapchat’s Sponsored Lenses are predicted to reach 16 million viewers daily. 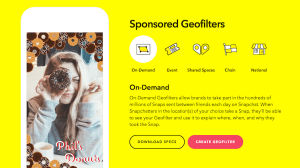 A Geo-location filer ad will be seen by 40-60% of Snapchats daily users. You can create your own geo-location filter ad and the price will vary based on duration, type, and targeting etc. Snapchat users spend an average of 24 seconds playing with a branded lens on Snapchat. If you create a branded lens on Snapchat, you can be quite sure that people will use it and thus get aware of your brand. 55% of Snapchat users say that they follow one or more brands or businesses on the platform. The interest for businesses on Snapchat is big, and that’s also the reason why many brands use it. 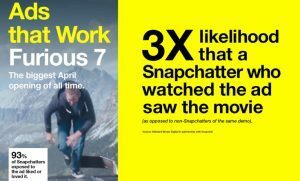 Some of the world’s top brands are even using Snapchat to build better relationships with their audience. More than 50 percent of the people following brands on Snapchat will open a brand’s story and more than 85 percent of a brand’s story. The way people discover and find brands on Snapchat varies. 64 percent of users will search for brands by the username, about 25 percent will use Snapcodes and less than 10 percent will use deep links. 58 percent of college students are likely to purchase a brand’s product or service if they are given a coupon on Snapchat. Share a Story to your profile and include an exclusive coupon to encourage people to take a screenshot of it or save it. What’s more, you can even send private snaps to each and every one that has added you to make the coupon feel more exclusive and so the people who receive the deal feel more personally selected.As long as you don’t do it every day, you will see quite good results. As long as you don’t do it every day and spam your followers so your messages lose power, you will be able to see quite good results.